Memory Lane Friday is a weekly blog carnival, where you blog about one of your memories and link up. This week has no theme. All are welcome! Something happens in November and December and all I can think about is food. I'm usually coming off a marathon, and with the holidays approaching, I start cooking all sorts of meals. You may have noticed I'm suddenly posting more recipes than usual. I can't seem to help myself. When I was in high school, my Dad created this snack that we all went crazy over. Take Triscuits. Top with cheese (slices of American or in this case, Velveeta). Add half of a green olive. Microwave for 20-30 seconds to make the cheese melty. It seems so basic, but they are delicious. Pierce is really crazy for them too. Next week's topic is "A Favorite Holiday Food". See what I mean about being obsessed with food? LOL! It's snacks like these that are always so tasty! That's fun that your dad came up with it. If I made these I would not be able to just eat one...Sounds really good. 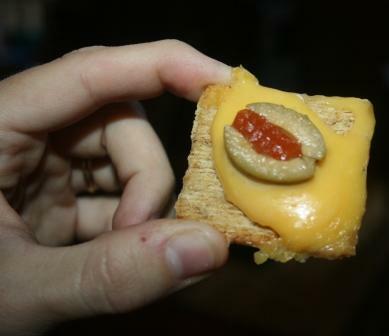 My dad would take saltine cracers put cheese on it and then drizzle with yellow mustard.. My kids used to have a cracker party with him.. They ate the whole sleeve of crackers..
Memories are a gift~ always in our minds to bring out and share. Velveeta makes everything taste great! And your snack is even colorful! Okay that looks so good and so simple - even I can do that and my grandson will love it. I have to get some. My mom used to make these, except she'd use green peppers instead of olives. Yours look way better: Going to have to give those a shot with my own kids. Cool stuff!